This month, we are welcoming 4th grade parents to 601 to tour the building and see our program in action, which reminded me of the fact that we are halfway through the school year already! Oftentimes we are so focused on looking ahead to what’s coming that we forget to pause and appreciate the here and now. We really appreciate the opportunity to connect, teach, and learn with your children, so I hope that you are able to take some time to appreciate just how wonderful your middle schooler is right now. Quick Reminder: Today the sun is shining, but most days so far have been pretty wet and rainy. Please remind your middle school student to dress appropriately for the weather, as they will still be walking to the Boys & Girls Club for PE. Congratulations to 8th Grade Blue student Ivan Harris (below) for winning our annual Spelling Bee! All of our finalists did an amazing job of standing in front of the entire middle school community and competing in the final rounds. It was made a little more exciting by the sibling rivalry with Ivan competing against his sister Anabel at the end. Finally, a big thanks goes out to 7th Grade Humanities Teacher Chris Wachter for being our resident "Bee Keeper!" Our second Project Day is upon us! It is scheduled for next week on Thursday, January 25, and the activities on this day are more directly connected to our curriculum. The 5th grade and half of the 6th grade will be heading to the California Academy of Sciences for a science exploration, while the other half of the 6th grade will head to Stanford University for a Food & Agricultural Sciences experience. (The 6th grade will have an opportunity with the other activity during our May Project Day.) 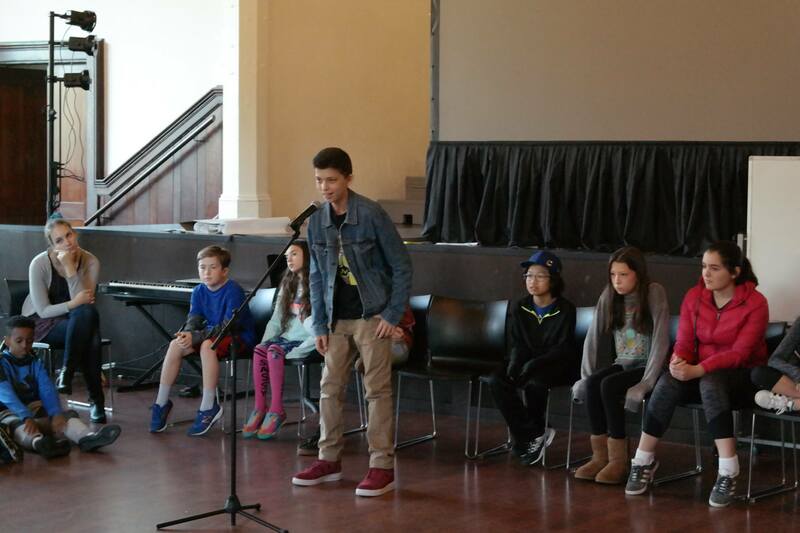 The 7th grade will be on campus working on a Music, Art, and Theater project, while the 8th grade will focus on their social justice projects both on campus and on the Embarcadero, where they will be gathering signatures for their gun control petition. With the middle of the second trimester upon us, advisors will be sending out mid-trimester updates today to certain students’ families. These updates will only be sent to those students who are either struggling or finding new success in a particular subject, so please do not be concerned if you do not receive one. If you have any questions about your child’s progress in a particular class, please remember that you are always welcome to email the teacher directly. If you have any questions about the process or logistics, please email me directly. To even out the number of weeks between the second and third trimesters, the faculty has decided to extend the second trimester one week. This makes the most difference to the trimester-long special classes: Drama, Food & Agricultural Sciences, and Innovation Lab. The new end date for Trimester 2 is Friday, March 2. The afternoon pickup process continues to be a hotspot for us with our neighbors. If your child does self-signout, please be sure that your pre-designated pickup spot is at least two blocks away from 601. Please expect to be asked to circle the block if your student is not waiting at the glass double doors. Thank you for being a good neighbor!